Imagine selling $2 million "worth" of Google stock and only receiving $50 in return? This scenario happens every day for venture-backed companies. Failure to quickly understand high-growth company valuation can cost trillions of dollars. Yet very few leaders involved in a venture-backed company have a definitive understanding of how valuation techniques are being applied to their financial statements and the decision-making process. Featuring extensive case studies of high-profile corporations, including Facebook, Twitter, and Microsoft, Venture Capital Valuation provides the knowledge and techniques necessary to understand and value high-growth companies. 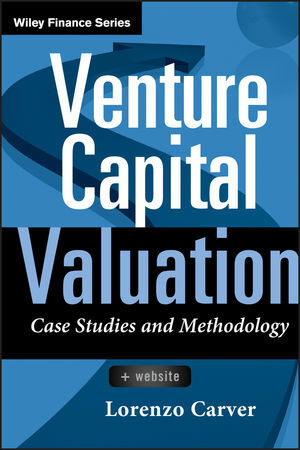 Sharing his twenty-year track record helping thousands of investors, practitioners, and entrepreneurs measure and realize high-growth venture, author Lorenzo Carver draws on real-world cases from investors, founders, and advisors to illustrate how each corporation was impacted by valuations. By putting these techniques into a context and framework, Venture Capital Valuation simplifies them so that anyone founding, running, and investing in these innovative companies can apply them immediately. An invaluable resource for anyone who wants to make the most out of their investments, Venture Capital Valuation shows business appraisers and venture capitalists how to maximize their returns and avoid losing moneybefore the damage becomes irreparable. LORENZO CARVER, MS, MBA, CVA, CPA, is CEO of Liquid Scenarios, a technology-based financial business intelligence solution company that provides services to investors, practitioners, entrepreneurs, and academics on how to measure and realize high-growth venture value. Carver has a twenty-year track record of helping thousands of clients understand how to measure and realize high-growth venture value. He is the author and developer of BallPark Business Valuation, the #1 selling, award-winning small-business valuation solution software covered by Bloomberg Businessweek, Entrepreneur, CPA Software News, The Kim Komando Show, and business journals worldwide.